DESCRIPTION: Located in Sherwood Country Club Estates, this property has four buildings on 6.5 acres of panoramic lake vistas. Belle Epoque interiors, promenade terraces, luxury rooms and suites, gardens, pool and tennis court. This is a noble domicile! YOUR MAMAS NOTES: This morning in the LA Times Hot Properties column, celebrity real estate diva Ruth Ryon discussed the tremendous neo-Georgian style brick pile that was recently sold by hockey legend Wayne Gretzky to baseball great Lenny Dykstra. If Your Mama is being honest, and we always are, we don't know who the Wayne Gretzky or Lenny Dykstra is. We understand the unfortunately named Mister Dykstra is a baseball person, a sport we know little about, and we understand that Mister Gretzky is a hockey person, a savage and violent seeming sport we know zip about. And you know what, late on Sunday night we simply can't be bothered to learn any more about these two clearly very rich sports figures. The monster mansion, which includes two guest houses and a carriage house, is so far from anything that Your Mama can even comprehend, were not even going to make sassy and dishy commentary. Rather we're gong to have a moment of silence while y'all peruse the insanely traditional decor, the impressively intricate plaster work and moldings, and the expansive grounds. Indeed Mama what more can one say about it.Why do people want to live like this? Wayne Gretzky,is a retired Canadian professional ice hockey player who is currently part-owner and head coach of the Phoenix Coyotes.He is generally regarded as the best player in history.He is the only player to have his number, 99, officially retired by the National Hockey League for all teams (i.e., no player in the NHL will ever again wear the number 99).On August 9, 1988, in a move that drastically changed the dynamics of the NHL, Gretzky was traded by the Oilers to the Los Angeles Kings.he is married to american actress Janet Jones. just for interest sake !! Mamma you are getting lazy. Fewer posts with less substance. Not a fan of the porte cochere -- makes the house look like an upscale motel in Kentucky. Whoever did the interiors, though, nailed that whole fin de siecle Beaux Arts vibe. Not what I'd ask for, but really well done. These are beautiful rooms. It's the last place I would have expected a hockey star to live. What do I know? I can't imagine living in a place like this because all I can think about is the house keeping nightmares. I know you hire people for that, but even so. That all said, it's a beautiful house. And to the children who are nagging Mama for more posts, let her for god's sake sit down and put her feet up once in awhile. Go back in the archives and read old posts, and let Mama catch her breath. Mama is getting lazy. I do not care if you have to find your information at http://www.bergproperties.com/blog/. They are up to date on everything. I visit this blog because I love Mamas sense of style and witty personality. Aunt Mary - people who own blogs update their sites constantly ie. Perezhilton.com and Dlisted.com. We are not asking for much. We still love our Mama! C'MON MAMA! Either you're becoming disillusioned with the hard work/no money blog life...or a Sugar Daddy/Boi Toi has divided your attention. I love the idea of "LIVIN' LARGE".I'm just not into "BIG FOR BIG SAKE" to prove it.This cottage-while attractive in a BLAKE & CRYSTAL CARRINGTON kinda' way is...stop me if you've heard this before...hideously overpriced and rather plainly styled. Either that or he's still blissfully speculating as if it were 2005.I don't think he ever made more than a coupla' million bux a year when he was at the top of his game.Last I heard he owned some car wash in the Valley somewhere.Can you buy a pad like that washing cars? I have zero, zip, nada interest in sports and even I know who Wayne Gretsky is and why he's famous. Only someone who grew up on the moon wouldn't and I think you're kidding us Mama. i agree with soul pole, what the hell is dykstra doing to afford this property? Frankly, this is the interior I expected to see at Fleur de Saperstein. At least there is some color and texture and not gold, gold, gold. I agree with someone...I'm not into living big for living big's sake and this place is BIG, but everything in Lake Sherwood is huge. The only saving grace is that, at least in Lake Sherwood, the lot sizes are BIG, so the houses don't look like they have built out to the very last inch of the property line, like some other neighborhoods we rag on. The googlemap pic shows this pad half built, majestically by itself on a hilltop surrounded by little(r) multi-million dollar houses. I'm reminded of European castles with their dependent villages. While I appreciate Mama taking the time to post on the weekend, I'd rather see posts M-F so that she can recharge over the weekend. Mr. Big Time is great, but he's a "just the facts" kind of poster-- I love Mama's dishy way of blogging and would hate to see her burned out. And I'm pretty sure that Gretzy had to sell this property to pay off some of his wife's gambling and legal debts. Miss Lucy lives in suburban America and two of her sons play hockey, so I had to wince a bit when Mama said she didn't know anything about the sport. Eh..can't expect Mama to know EVERYTHING. Regardless, that is a house that tries too hard. Blech. I think the house is nice and tastefully done for the style which is not something I personally would own. The LA Times column says they also have a home in Arizona (near the hockey team) that they are living in and lists the reason for the sale as Gretzky wanting to devote more time to his latest venture, winemaking in Niagara Fall, Canada. Ah, yes. Now I remember poor Wayne and the gambling missus. I think she got dangerously close to getting super clean Wayne in trouble. If you believe what you read, it was entirely her problem. Addictions. Oh,the sorrow and woe. What level of unaware do you have to stoop to to not know who Wayne Gretzky is? He's been incredibly famous for at least 20 years. That is a lot of money for a house way out in the valley. It's hot and boring out there! What level of unaware do you have to stoop down from to actually give a damn who Wayne Gretzky is? Seriously, is hockey in a relevant sport these days? 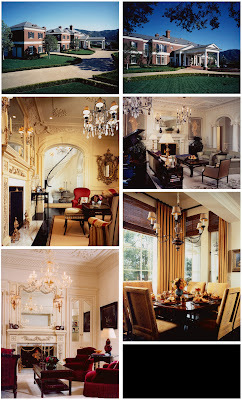 Having spent time with Mr. D, I can't imagine him living in such an over the top, lavish place. He has a voracious appetite for living large but he's such rough around the edges I can't even picture him in such formal surroundings. Lordy.. who has time for acting or gambling while taking care of her man, birthing and raising all them kids? yall need to get a life. 1) Dykstra has this kind of money and 2) Gretzky or Dykstra want to live in a house so formal and elaborate. Oh well, now I'm schooled. And can someone please dish more about Janet Jones' gambling problems?? That's juicy. SHe was hot for like one year. thanks for the info on dykstra & his car washes, very interesting. he always struck me as rough around the edges also, so its hard to picture him in that type of surroundings, but he is doing well. he doesn't have to chase the memorabilia money. I can't believe Lenny Dykstra still has money; haven't heard about him since the Mets were in the WS. Setting is nice, but the house is about like Gretzky's wife Janet. Faux royal. Lenny Dykstra was an All Star Baseball player for the New York Mets and the Philadelphia Phillies. He is now an All Star business man who unlike other professional athletes has made good decisions with his investments. Lenny Dykstra and his family deserve this wonderful home! I think Lenny is grounded in a big way and doing quite well for himself and his family. Why would he buy an 18 million dollar home if he didn't have Happiness?! Of course this is my opinion! I guess what everyone here doesn't know is Lenny sold his entire car wash business. Major Cha Ching. And now he is trading deep out of the money call options and writing a finance column for TheStreet.com...beats washing cars. If anyone cares to know the truth how Lenny Dykstra ended up with that new home one need go no further than to look at the fiber of Lenny himself. Lenny didn't build those car wash businesses; he invested some money into limited partnerships that soared as a result of hard work put in by his brother and best friend, both of whom Lenny screwed over to get the money to buy Gretzky's house. Sadly, Lenny has even abandoned his own mother out of shame for screwing her younger son. But this behavior only scratches the surface of the monster that Lenny has become. I don't wish him harm, but I do feel sorry for him as it must be difficult for him to look into the mirrors in that beautiful home and know that he had to inflict great pain on his love ones for the sole purpose of upgrading from 7k to 12k sq ft. I don't know if the steroids has caused him to lose his mind, but the quantities he took during his baseball playing days were clearly higher than the recommended dosage. Lenny will likely not challenge this TRUTH because he knows there is so much worse behavior behind it. But if he does...what's up dude? I can tell you that Lenny Dykstra bought Gretzky's house because he was previously living in the dog house for getting caught fraternizing with a member of his wife's family. I grew up with Janet Jones in St.louis, trying to get ahold of her, can anyone help. You know I think that some of you should honestly not speculate on topics you know nothing of just to act like you have something to say. When I 1st moved back out here Lenny's family hired me on at his car wash in Simi Valley (not San Fernando)as the assistant manager of the boutique inside the wash.He also owned another car wash in Corona. And it wasnt like a normal car wash, he worked hard to make it an experience for his customers, thats why people would drop $30 every week to have it washed there. And Mr Dykstra still owned the car wash for monthes after he bought his new home. He has always been respectful of those round him and seems to have a really positive relationship with his wife Terri, their children, he even hired Terri's brother and sister in law to help him run his buisness, showing that he does nice things b/c he cares about his family not b/c hes in the "dog house".